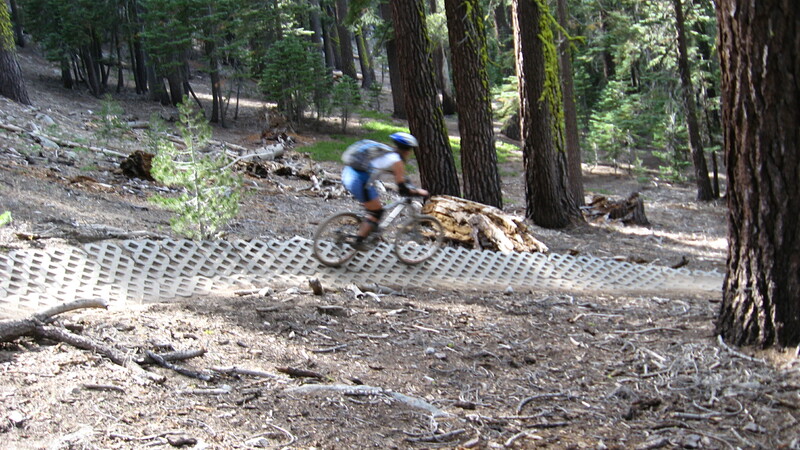 Mr. Toad’s Wild Ride, before it became an alias for South Lake Tahoe’s most technical single-track mountain biking trail, was a famous theme park ride in the late 1900s at California’s Disneyland and Florida’s Magic Kingdom. Seated in multi-colored motorcars, guests of Mr. Toad’s Wild Ride blindly followed a track in the dark, which made abrupt, jerking turns, and often the car would travel at full speed towards an oncoming obstacle, only for it to move out of the way at the last second. Mr. Toad’s single-track mountain biking trail follows a similar track as the Disney version, offering sudden turns and steep downhill sections before oncoming boulders, rock gardens, staircases, roots, logs, and sandy patches – except in the mountain biking rendition of Mr. Toad’s, the obstacles do not move out of the way at the last second! Be sure to carry spare tubes for this rock-littered, unforgiving, lunatic of a ride. Starting close to the apex of Luther Pass, on the north side of Route 89 near Grass Lake, the trail embarks on a serious climb from the get-go, up a pine-shaded mountainside. 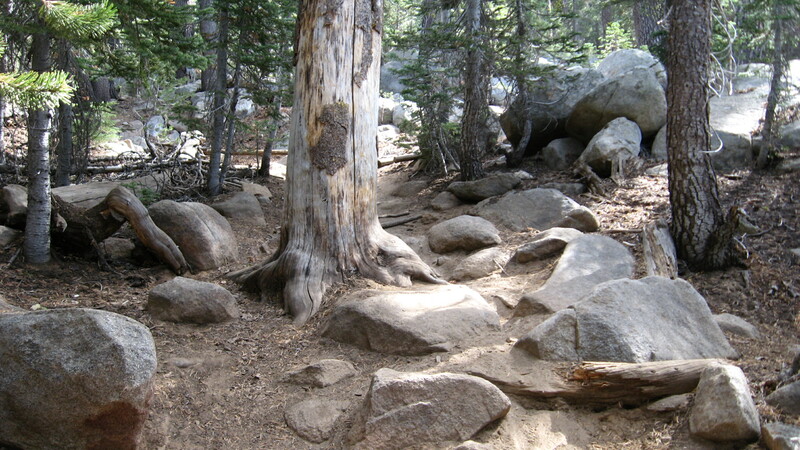 At 0.6 miles, the path adjoins with the Tahoe Rim Trail coming from Big Meadow campground. 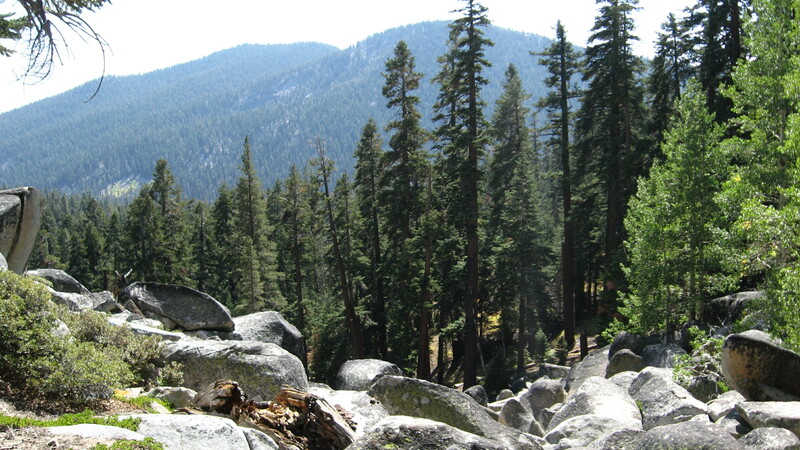 Stay to the right and climb for another 1.5 miles through meadows of wildflower and tall forests until you reach a false summit, which grants vistas of Waterhouse Peak and Hope Valley. This is a great location to catch your breath, because your muscles need all the oxygen they can get for the duration of this killer climb. The trail ascends for half a mile more through an open, bouldery area and reaches its true summit at the ridge. 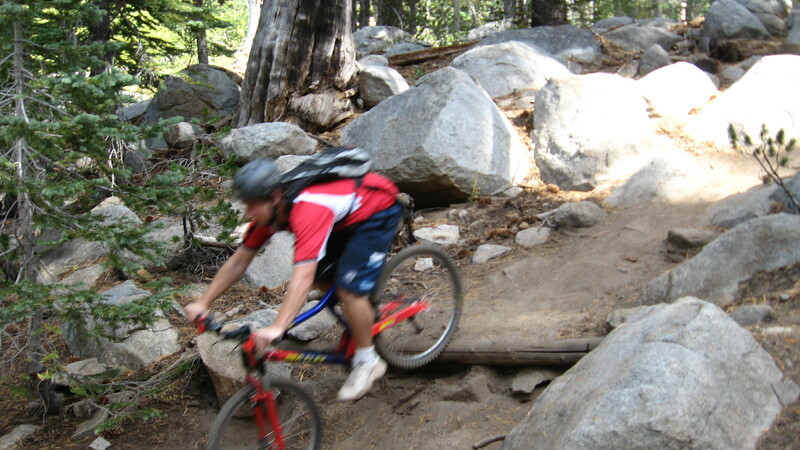 In addition to this climb’s steep grade, sporadic technical maneuvers up and over boulders are required for advanced riders who wish to stay on the bike. 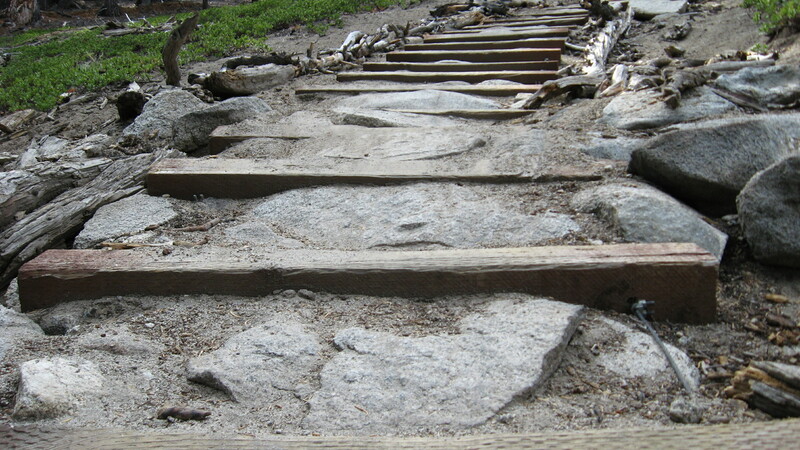 However, when momentum and technique fail, even expert riders dismount on near-impossible sections of this climb, so don’t fret about walking! From here, ride a short, half mile downhill stint to Tucker Flat, where a wooden post marks the Saxon Creek – Armstrong Pass junction. Turn left (northwest) for 2.1 miles of extremely technical downhill along the Saxon Creek drainage. This section boasts 100 yard rock garden segments with drop-offs at the end for the dare-devil elite, as well as plenty of boulders, sand traps, sharp corners, and thick, gnarly tree roots which could throw you off your bike if you aren’t paying attention. After the trail’s first stream crossing, you know the most technical, wildest part of Mr. Toad’s is over. While the single-track smoothes considerably, intermittent rocky portions still streak the trail. Much like the Disneyland adaptation of Mr. Toad’s Wild Ride, riders can never let their guard down on this tumultuous journey. 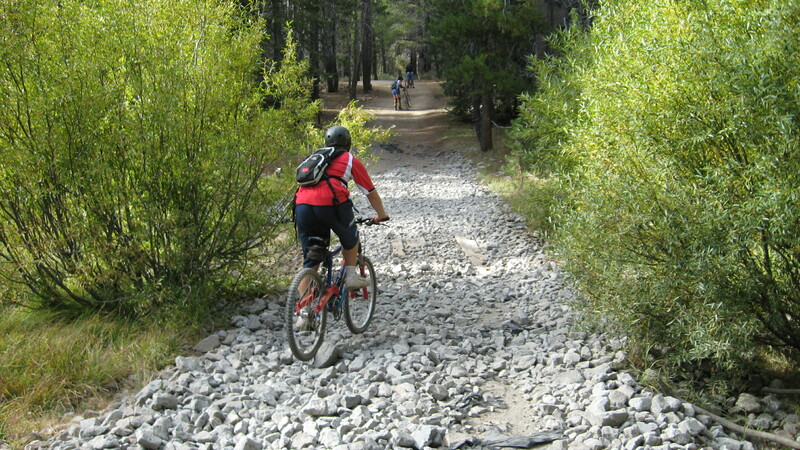 Bikers will cross Saxon Creek’s offshoot streams two more times, before a short climb out of the drainage presents itself. 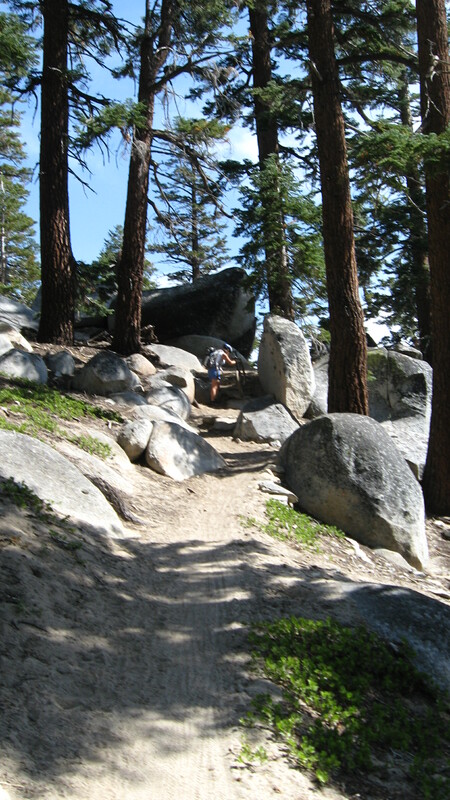 Thereafter, a quarter-mile of tortuous, steep, soft dirt begins to mellow into banked, single-track turns. The last half of the downhill is quite different from the first half. 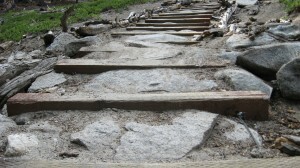 While the first three miles require technique, weight transfer, and advanced bike handling skills, the last three miles of Mr. Toad’s downhill reveal smooth-riding rollers, a couple of dug-out, dirt staircases, and banked curves – one of which contains a makeshift lattice. 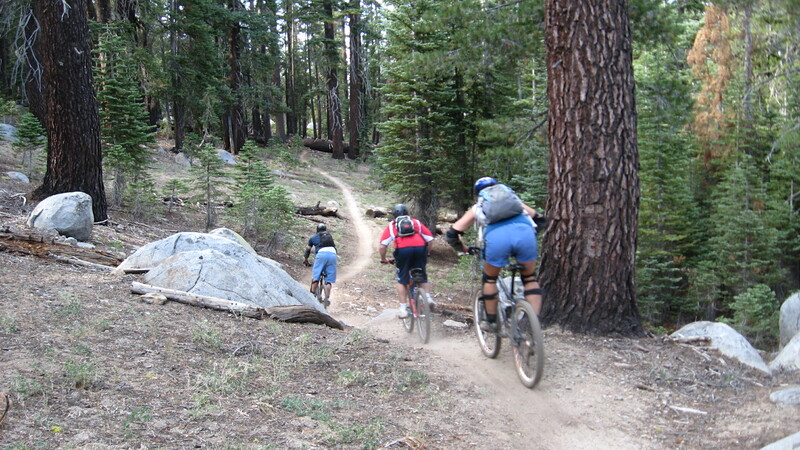 This speedy last leg of Toad’s is a blast for mountain bikers of all levels. Mr. Toad’s winding, rolling single-track finale eventually widens into a double-lane dirt road, which traverses a pool of fist-sized rocks, before climbing the end bit to paved, Fountain Place Road. If you decided to shuttle, hopefully your car is located here in a quasi-parking lot at the trailhead. As a side note, Fountain Place Road turns into Oneidas Road, which intersects with Pioneer Trail near Meyers. Say your automobile is not equipped to transport five or so bikes from Oneidas/Fountain Place Road up to the trailhead atop Luther Pass? 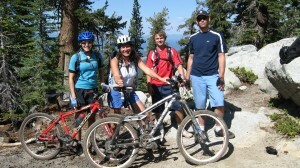 Wanna Ride – Tahoe Bike Shuttle & Tours is there for you. 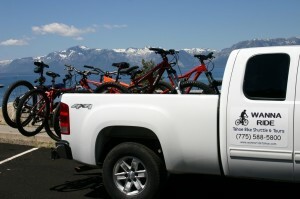 For a small price of $8-12 per person, company owner, Kat DeBacker, will meet you at your parked car on Oneidas, load up the bikes in her extensive truck bed rack system, and drop you off at the Toad’s trailhead. Wanna Ride, South Lake Tahoe’s first point-to-point shuttle service, operates daily from 8 a.m. – 6 p.m., June through September. 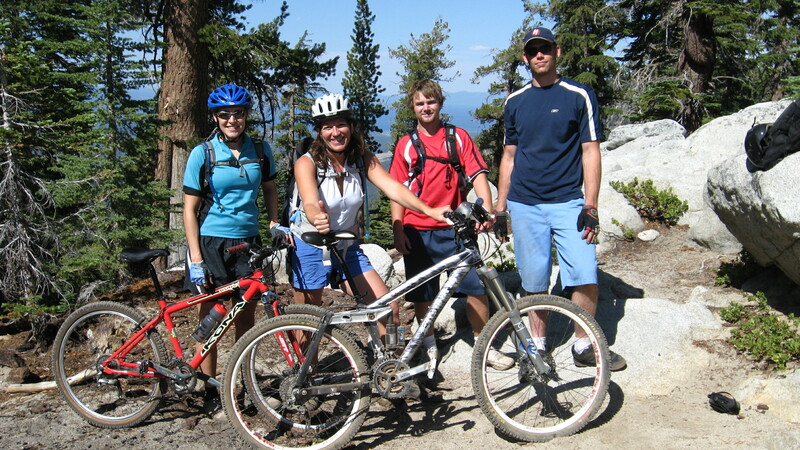 For climbing enthusiasts opting for the whole 20 mile loop on bike, utilize South Upper Truckee Road, just west of Highway 89 (Luther Pass) off Route 50 in Meyers. This quiet, residential road turns country quick, climbing through lush meadows and dense pine forests up to Big Meadow campground. Here, make a left turn onto Highway 89 for the last stretch of pavement up to Mr. Toad’s trailhead on the left-hand side. All in all, Mr. Toad’s Wild Ride climbs 1,200 feet in elevation over 2.5 miles and descends almost 2,500 feet over 6.5 miles. 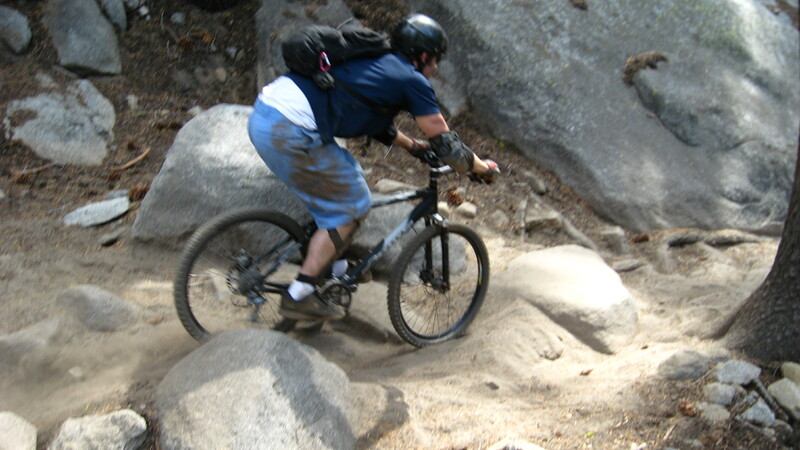 While the ascent is arduous and mentally-taxing, the all-around downhill is exhilarating. 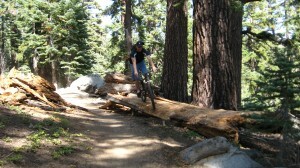 Both Disneyland regulars and Tahoe mountain bikers know all too well – you have to pay to play on Mr. Toad’s Wild Ride. great details on the ride-keep them coming!! Could you past a map of the trail?